While I'm not exactly a Palm fan, I was able to get my hands on the Palm Treo 755p from Sprint for a few days as a friend loaned it to me. If you don't own a Palm device but you own a Windows Mobile device, handling a Palm can only take a few minutes of getting used to since the navigation menu on this device is very user friendly. The Palm Treo 755p runs on Sprint's CDMA 2000 1X EV-DO network and has the Palm OS 5.4.9 as its operating system. The Palm Treo 755p has a built in 128 MB of memory and can be expanded using a miniSD card. The device also has a 2.5 inch TFT touch screen with 65k colors and 320 x 240 resolution. Palm, as many of you know has revolutionized the smart phone, however, because of lack of new products it has been pushed back by competitors such as the iPhone and smart phones from Nokia and other cellphone manufacturers. Though I'm really not a Palm fan, I was surprised that I liked using the 755p. The Intel 312 MHz Xscale processor on this device can run applications smoothly with minimal hang-ups which makes it great for running the different applications preloaded on the Palm Treo 755p such as SprintTV, PocketTunes, Web Browser, Instant Messenger, Palm Desktop Software, etc. 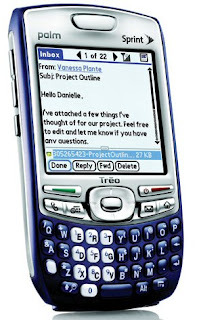 I like the fact that the Palm Treo 755p can handle the three different Instant Messaging Clients-Yahoo, AIM, and Windows. This Palm device also has built-in support for Microsoft's Direct Push Technology so you can have access to corporate email, that is, if your company supports push email technology. However, the damper is that even though the Palm Treo allows you to have access to your IM accounts and corporate email, it lacks WiFi connection so you're limited to using Sprint's EvDO network, the upside is Sprint's network is still relatively fast compared with AT&T's EDGE network. The Palm Treo 755p also has an integrated 2 mega pixel camera however I was disappointed to find out that the picture quality doesn't really meet my standards. I'm now starting to wonder if a smart phone with good camera quality really does exist as most smart phones that I have come across only has subpar picture quality. The Palm Treo 755p also doesn't have a Bluetooth A2DP profile so audio streaming using your Stereo Bluetooth headset is out of the question. The built-in PocketTunes allows you to listen to your music but you're limited to listening to MP3s, WAV and MIDI formats, if you want to listen to WMA audio, you need to upgrade your current PocketTunes software. Overall, I have to say that the Palm Treo 755p is more geared towards business individuals. The subpar camera quality and the limited music playing capability doesn't really make the Palm Treo 755p an ideal all-in-one smartphone device. i dont understand what you mean by subpar music playability considering it does play all of my mp3s and who doesnt have a wma/mp3 converter anyway.... i say deal with it and convert all your audio to mp3 anyway.... also i thought it takes great pics for a camera phone! i mean what do you expect its a phone before its a camera, dont you own a camera anyway. love this smart phone and ive only had it two days.... sorry if this comes off standoffish but its just my opinion.... great topic though!!! I've reread the article and I don't think I've mentioned subpar music playability, I was referring to the picture quality. What I meant by subpar is that when compared with other mobile phones with video camera, it doesn't meet my standards. I own a digital camera and I know for a fact that a phone can never replace a stand alone digital camera even though other people might think so but when compared to the picture quality of Nokia and Motorola devices with the same camera resolution, picture quality is just so-so. As for the audio, some people who's always on the go--like me for instance, doesn't have the luxury of converting music files so I just wish that it can also play WMA audio. Thanks for the comment, anyways I had fun with the Palm Treo 755p. Just a quick clarification: the Treo 755p screen resolution is 320x320, not 320x240. I doubled check, sorry bout that. I must have not used my glasses when rereading my review. Thanks for the clarification. is Palm-based smartphone with 320x320 touch display. You can add stereo Bluetooth software for about $20.